Most people take many things for granted, including our opportunities to enjoy the fine Ontarian outdoors. Climbers are no different: few fully appreciate our access to cliffs and blocs. In reality, tireless work is required to maintain excellent relations with land managers, to reduce environmental impact and to mitigate certain risks. 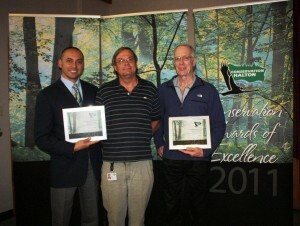 At the 29th annual Conservation Awards of Excellence ceremony held on June 2, 2011, Conservation Halton recognized the contributions of Kit Moore and Harry Hoediono. Between the two of them they have contributed to access efforts on the Bruce Peninsula, the Beaver Valley, the Milton area and Bon Echo. The 2011 Community Award was received by these two, for their particularly important contributions to Conservation Halton’s Tope Rope Anchor Project. This makes climbing at Rattlesnake Point, Bottle Glass Cliff and Buffalo Crag safer and reduces the impact on the cliff top environment. Congratulations Kit and Harry – great effort for a job well done!